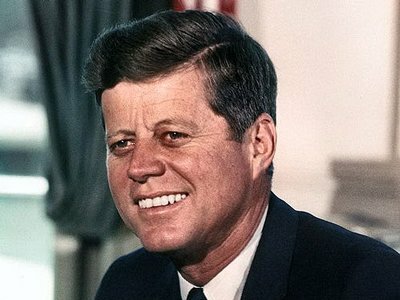 As it goes through the motions of acknowledging the centenary of the birth of John Fitzgerald Kennedy on 29 May 1917, the mainstream media will, of course, continue to conceal the true significance of his life and his achievements as United States' President and, before that, as an elected representative in both the United States' House of Representatives and Senate. Heroically, on at least two occasions, JFK overruled plans by the United States' Joint Chiefs of Staff to launch a first strike nuclear war against the Soviet Union. For that alone, the debt of gratitude owed by humanity to JFK cannot be repaid. One hundred years ago, on 29 May 1917, John Fitzgerald Kennedy, better known to us as 'JFK', was born to the business magnate Joseph P. Kennedy Senior and Rose Kennedy. At that time, most advanced industrial countries, including Australia, were fighting each other in the 'War to End All Wars' of 1914-1918. The United States was to join that war shortly afterwards. A total of 18 million lives were lost in that war by one estimate. That includes 116,708 from the United States and 60,000 from Australia. In subsequent years, the Second World War of 1931-1945 followed the supposed 'War to End All Wars'. In that war JFK's elder brother Joseph P. Kennedy Junior was to die heroically in 1944 test-flying a BQ-8 "robot" bomber or drone, which had been converted from a B-24 bomber. JFK himself, after overcoming a medical disability, which prevented him from joining the U.S. Navy Reserve in 1940, took command of the PT-109 Patrol Torpedo boat in October 1943. Lieutenant Kennedy's courageous conduct as commander of PT-109 in the fight against the Japanese in the Solomon Islands was to be subsequently depicted in the book PT-109 and film of the same name. After the war, JFK was elected to the U.S. House of Representatives in 1946. From 1953 until he assumed the Office of President, JFK served as Senator. During that time JFK became renowned as a supporter of political movements by colonial peoples for independence, notably the Algerian FLN which was waging a guerrilla war for independence from France. One of the most carefully researched, widely published and officially ignored speeches Senator Kennedy ever delivered was his address in 1957 outlining the interest of the West in a negotiated solution for eventual self-determination in Algeria. The speech proved to be substantially and in some ways distressingly prophetic in subsequent years, but it was bitterly criticised at the time in Washington as well a Paris. his name and speech, he later discovered, were hailed throughout Africa—and an American correspondent who visited the Algerian camp related to the Senator his surprise at being interviewed by weary, grimy rebels on Kennedy's chances for the Presidency. There was, however, no Algerian vote in this country and reporters looked hard for motives. If JFK were alive today, he would be just as strongly opposed to the meddling in Syria, Iran, Yemen, Ukraine, Somalia, etc. by the current rulers of the United States. Today, should total war ever break out again--no matter how--our two countries would become the primary targets. It is an ironic but accurate fact that the two strongest powers are the two in the most danger of devastation. All we have built, all we have worked for, would be destroyed in the first 24 hours. And even in the cold war, which brings burdens and dangers to so many nations, including this Nation's closest allies--our two countries bear the heaviest burdens. For we are both devoting massive sums of money to weapons that could be better devoted to combating ignorance, poverty, and disease. We are both caught up in a vicious and dangerous cycle in which suspicion on one side breeds suspicion on the other, and new weapons beget counterweapons. Thank you for keeping the knowledge of JFK's importance to peace and democracy alive, James. I think you have written about him every year on this date. You are right to say that the mainstream media will continue to try to bury his good works. Dr Tim Anderson has been threatened to be sacked by the University of Sydney where he works as an academic for denouncing their treatment of Jay Tharappel, Tutor, and also for denouncing their guest's, Sen John McCain, link to Al-Qaida. John McCain's trip to Australia was sponsored by the University of Sydney US Studies Centre in conjunction with News Limited (Murdoch's press) and the Australian Govt.